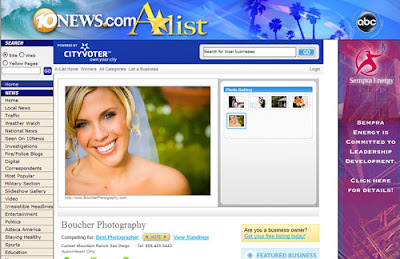 Bouchér Photography: Bouchér nominated for KGTV 10 News A-List! Vote for us now! Bouchér nominated for KGTV 10 News A-List! Vote for us now! Okay, so here's the dealio, Marissa and I (Weston) at Bouchér Photography have been nominated for the KGTV 10 News Station's A-List for Best Wedding Photographer in San Diego. Honestly, your 60 seconds of time to vote could give Marissa and I a ridiculous amount of exposure and potential business due to the fact that the winners will be listed for an entire year on the A-List site. Please, please, please we would be so grateful if you could vote for us at the following link...VOTE HERE! Make sure you un-check the boxes to not receive promotion emails then simply use the vote submission email to finish the voting process. Can't thank you enough! We love you all! I cast my vote! Best of luck.